Female Occurs locally throughout southern England and the midlands northward to Westmoreland but with only scattered records from the west country, north Wales and the north west. 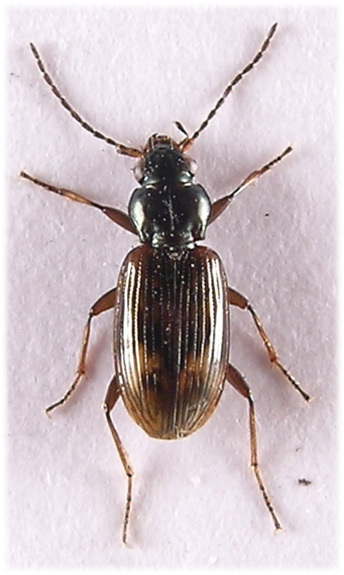 Found through the summer among waterside vegetation, usually in small numbers and often in company with other carabids. 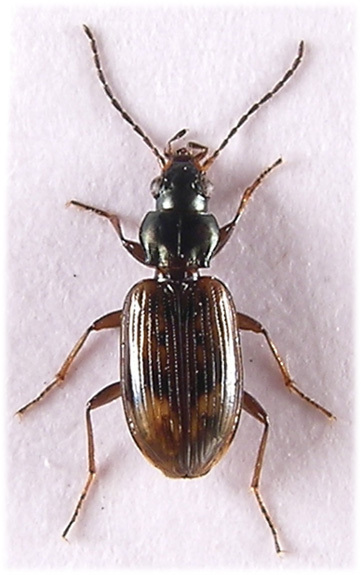 They breed in the spring and at this time may be found together in large numbers, again with other carabids, on exposed waterlogged or damp soil sometimes far from water. At this time they are very active during hot sunshine and under these conditions we observed dozens of dentellum among hundreds of other carabids ¹ running fast between the shelter of stones and small logs on Common moor during April 2007. They are macropterus and presumably disperse by flight as the above observations were recorded more than 100 metres from the river and where the soil bakes dry during the summer. 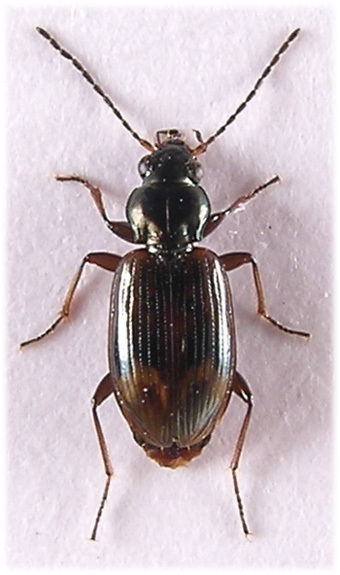 Unlike many species of Bembidion, dentellum is not active nocturnally. 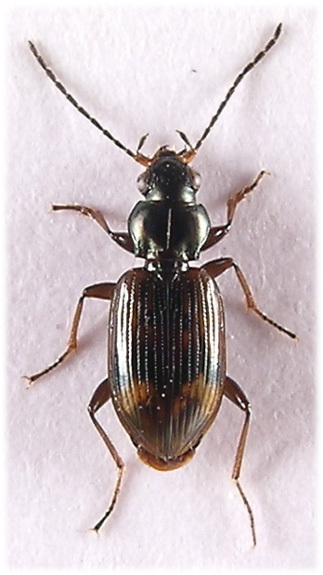 A large Bembidion, 5-6mm., which is soon recognised in the field. Antennae and palpi dark with base lighter, maxillary palpi long with reduced terminal segment. Two long setae situated within the inside margin of each eye, the anterior of which is surrounded by a shiny elevated area at the base of the frontal furrows. Frons smooth and dulled from dense microsculpture. Eyes prominent, temples more or less parallel. Pronotum broadly cordate and strongly margined laterally, with large basal fovea and a tiny longitudinal ridge between those and the lateral margins. Base almost straight with a long seta at hind angles and centre of side margin. Elytra with shoulders rounded (cf. B.lampros, B.properans) and striae punctate and complete to apex. Two punctures within third interstice free, not touching striae ². Dark brown and irridescent due to transverse microsculpture, with various lighter markings but these may be obscured or missing; usually humeral, apical and arranged transversely before or after middle. Legs brown, femora darker with top surface black or with metallic green lustre. Forebody black and dull metallic from microsculpture, contrasting with elytra but often marked metallic green on labrum, forntal furrows and margins of pronotum. ¹ B.guttula Fab., B.articulatum Panz. (esp. 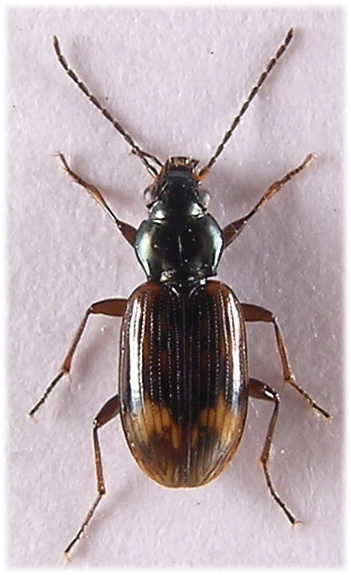 common), B.varians Ol., B. tetracolum Say, B.lunulatum Geoff., B.biguttatum Fab., Pterostichus diligens Sturm, P.minor Gyll., Elaphrus cupreus Duff., E.riparius L.
² Posterior puncture somtimes closely approaches 2nd stria but is never situated within it.